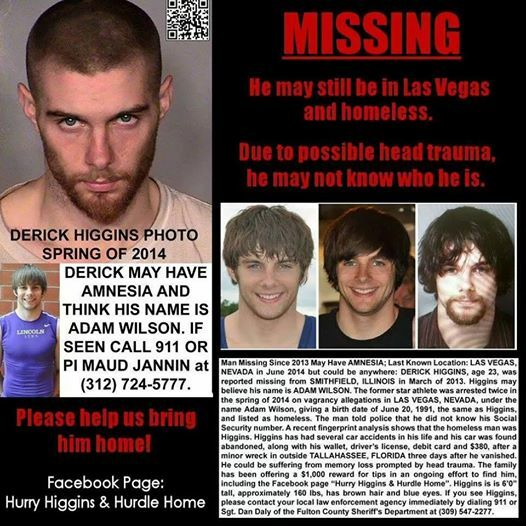 FOR THOSE NOT ON FACEBOOK, WE HAVE BEEN FOLLOWING THE STORY OF DERRICK HIGGINS, AGE 23 WHO WENT MISSING FROM ILLINOIS IN MARCH 2013. DERRICK WAS THOUGHT TO HAVE AMNESIA DUE TO A HEAD TRAUMA. HIS PARENTS WERE LOOKING FOR HIM AMONG THE HOMELESS (LIKE SEAN). DERRICK'S CAR WAS FOUND IN FLORIDA, CONFIRMED SIGHTING IN LAS VEGAS & TODAY IT HAS BEEN CONFIRMED THAT DERRICK WAS LOCATED IN SAN DIEGO. HE IS NOW IN A CALIFORNIA HOSPITAL, WITH HIS PARENTS EN ROUTE!! PRAYING FOR DERRICK'S RECOVERY!!! Perhaps a miracle is ALSO possible for Sean!!! KEEP PRAYING, SPREADING THE WORD, POSTING & KEEPING AN EYE OUT FOR SEAN AMONG THE HOMELESS. Help us bring Sean HOME!!! 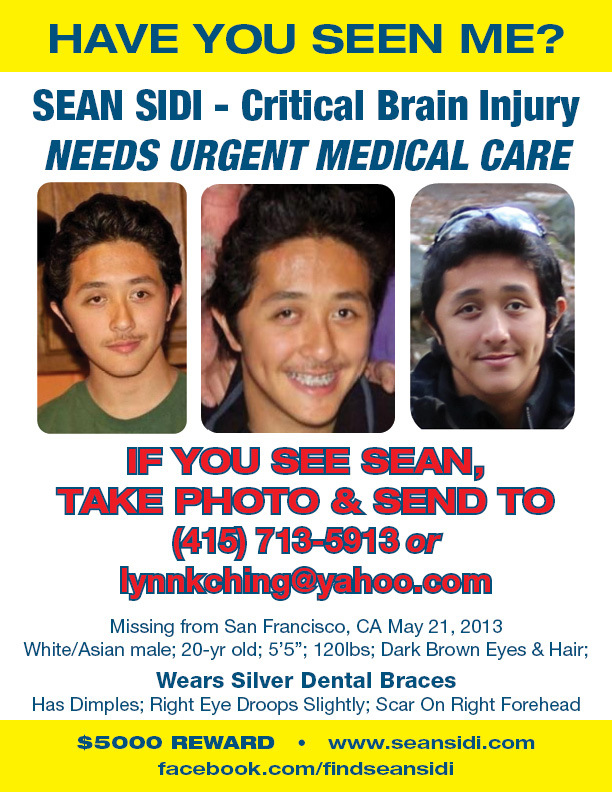 See www.facebook.com/findseansidi (this is a PUBLIC PAGE & YOU DO NOT need a FB account) or www.seansidi.com for more information on Sean Sidi, age 19, missing from San Francisco since May 21, 2013, shortly after suffering a traumatic brain injury. ***Please email lynnkching@yahoo.com w/your address to have Sean's fliers mailed to you (refills welcomed!) anywhere in the U.S.
Sean is still missing...1 Year - 7 months - 25 days. Sean's phone went dead/turned off at @1:35 pm on May 21, 2013 in a very busy area of Golden Gate Park in San Francisco, CA. Since that time, there has been NO phone, bank card or other electronic activity. Sean - in his compromised/healing physical & mental state - could not have gone far or survived for long on his own. Someone knows something. Our search continues...for Sean, for California Missing Five, for others. 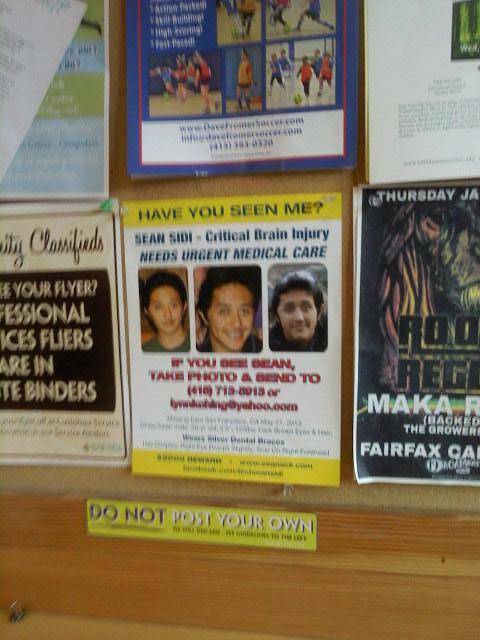 Below: Sea's flier in 'The Good Earth' in Fairfax, THANK YOU Tina A. for your messages of hope & love & for posting Sean's fliers. MORE Random pictures of Sean: 1) Sean & Danielle 2) Sean (2nd from right) with sister Danielle & cousins Rachel, Sidney & Gareth the summer before he vanished. We post these to remember Sean... ..his smile, his laughter & all the LOVE & JOY he brought to our life. Sean is more than a missing person...MUCH more. See www.facebook.com/findseansidi or www.seansidi.com for more information on Sean Sidi, age 19, missing from San Francisco since May 21, 2013, shortly after suffering a traumatic brain injury. As the mother of a missing child, I had hoped against hope that 21 year old college student Shane Montgomery, who went missing a month ago after leaving a bar, would be found alive. THE sheer RELIEF in finding a missing child/loved one (EVEN IF FOUND DECEASED), CAN ONLY BE FULLY APPRECIATED if you have suffered the AGONY of "not knowing" [where your child is], and endured the daily TORMENT of wondering whether you will EVER know. The search for Shane, despite its tragic outcome, was a model of excellence & efficiency. From the start, law enforcement in PHILADELPHIA requested the help of the public (via media), obtained surveillance tapes & ENLISTED the ASSISTANCE OF THE FBI and K9 search and rescue teams. Helicopters were ALSO used in an effort to locate Shane. San Francisco Missing Persons Dept should take NOTE. In Sean's case, & despite his life threatening brain injury, law enforcement in San Francisco ("LE") NEVER ever sought the public's help via media (our contacts did); LE declined to request the FBI's help and they REFUSED to allow Marin K-9 search and rescue team to enter SAN FRANCISCO to search for Sean (a private K9 team searched months later). SEAN'S correct Phone PING information was obtained by LE almost 2 weeks after Sean vanished, and ONLY after repeated requests by this family. San Francisco is a model of INEFFICIENCY, the price for which Sean likely paid with his LIFE. Sadly, this is more the RULE than the exception in San Francisco. Picture below: Vigil in June 2013. 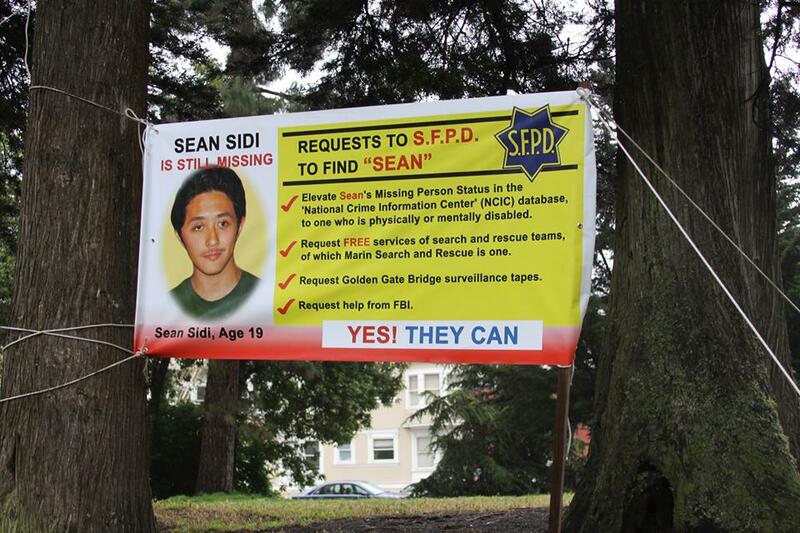 See www.seansidi.com and www.facebook.com/findseansidi for more information on Sean Sidi, age 19, who vanished from San Francisco on May 21, 2013 shortly after sustaining a traumatic brain injury. We are still hoping for a miracle in 2015, but if that is not to be - then answers for us, and for others with missing loved ones. A few old pictures of Sean & Danielle - I think Sean was @ 14 yrs, Danielle 11 yrs... Also a picture of Jeff K.'s precious Christmas gifts of warm beanies, socks (in Safeway bags) and SEAN's fliers to the kids living in Golden Gate Park. ***Please email lynnkching@yahoo.com to have Sean's fliers mailed to you (refills welcomed!) anywhere in the U.S. Despite the passage of time, SO many of you continue to search, hope, post and pray that we might one day experience a miracle and hold Sean, SAFE, in our arms again. 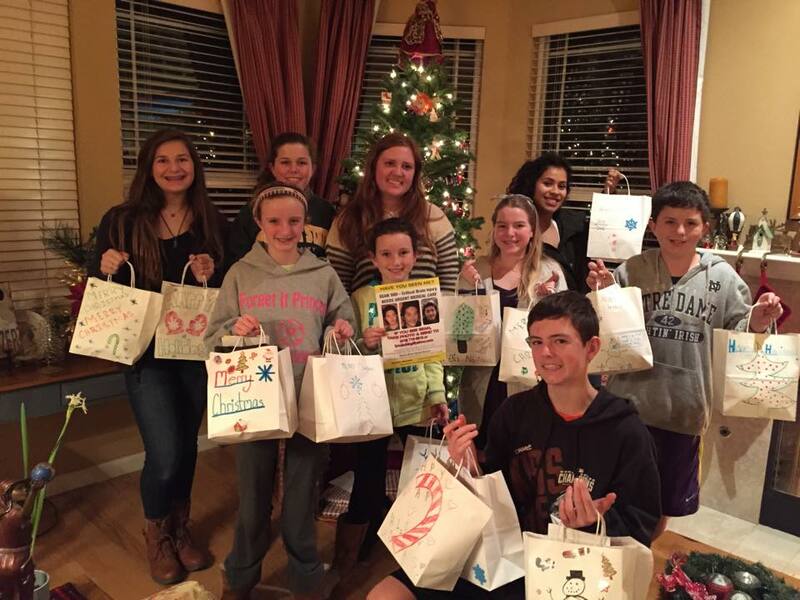 Below are a few year-end pictures of some of your efforts: 1st Photo, Rosie F & friends prepared bags for the homeless in Marin, CA & included Sean's Fliers!!! 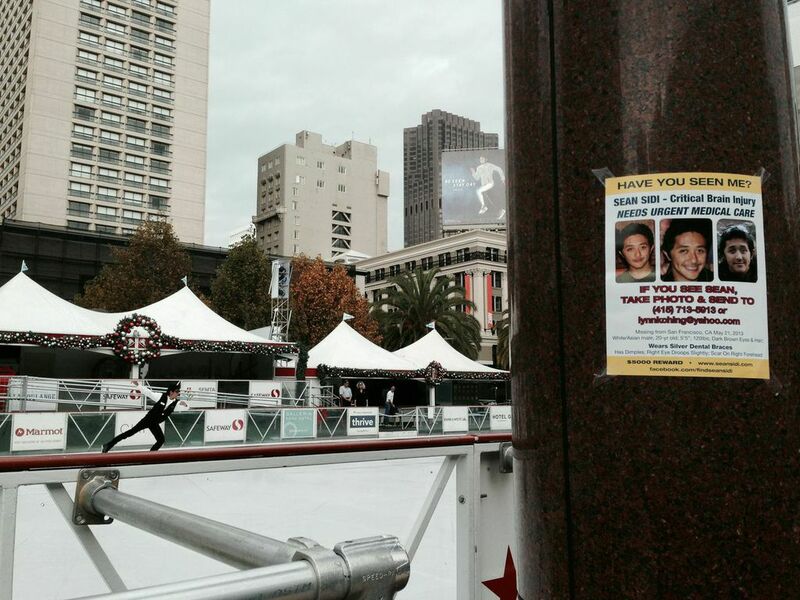 2nd & 3rd Photos: Sean's Flier on Union Square, San Francisco, among hundreds of shoppers & tourists. Thank you Rosie, Ann and ALL for supporting our search for Sean!!! See www.facebook.com/findseansidi or www.seansidi.com for information on Sean Sidi, age 19, who went missing from San Francisco CA on May 21, 2013, shortly after suffering a traumatic brain injury. Sean may not know his name or his dire medical needs due to his injury. Email lynnkching@yahoo.com with your address to have a packet of Sean's fliers mailed to you anywhere in the U.S.
UPDATE of "Sean" Sighting in San Leandro, CA: Sean's dad, CLAUDE is in San Leandro. He saw someone POSSIBLY meeting the caller's description (puffy jacket...) This person is not Sean, but we are NOT SURE this is the PERSON sighted by the caller. We tried texting a photo to the caller but it bounced back. LVM with person calling in tip.... Claude talked to many people & kids in the area, posted & handed fliers. The Thrift Store, ORBIT store & others in the area have posted Sean's flier in their business. I will post an update if and when we hear from the caller who sighted "Sean". So many of you have followed our search for Sean. HOPES raised & shot down so MANY times... We know that It could be days, months, years or NEVER.. Bless you all for your presence and support throughout this nightmare. I received a call early this morning (I was sleeping & did not pick up until a few minutes ago) reporting a sighting of "Sean" near a THRIFT STORE at 164th Avenue (in vicinity of East 14th), in the city of San Leandro, CA. "Sean" was wearing a BLUE CAP, 'puffy jacket' (color ? ); blue jeans and looked "in VERY, VERY, bad shape". The caller described dimples. "Sean" was looking at a flier (which one of you posted) and said "that's me". I just spoke with the caller - SHE IS an hour away but is NOW driving back to take a photo of "Sean" & to get him on the phone. The caller said she had seen "Sean" there before. HOWEVER, she DID NOT KNOW THAT SEAN WAS MISSING UNTIL SEEING A FLIER one of YOU posted AT the BAYFAIR BART STATION & AT 164TH AVENUE / EAST 14TH location (bus stop) IN SAN LEANDRO, CA. SEAN'S DAD CLAUDE IS HEADED OUT THERE NOW. 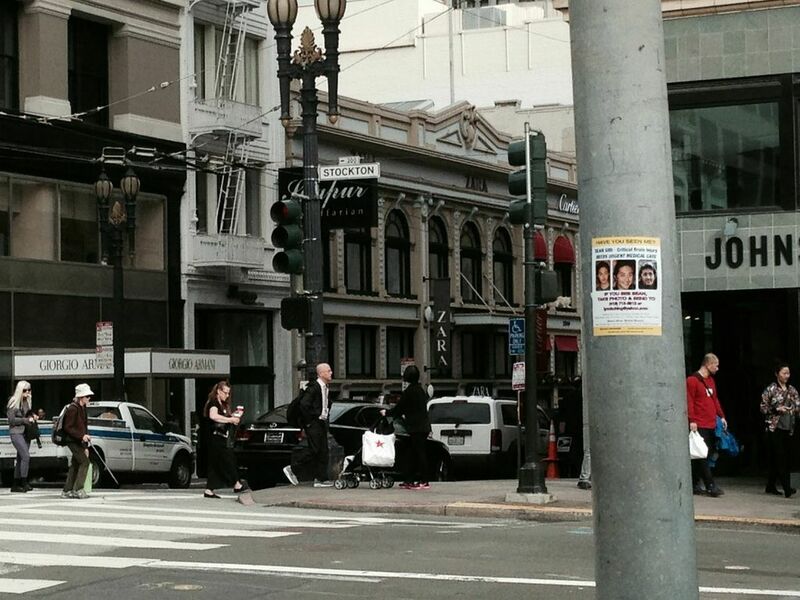 IF YOU ARE IN THE VICINITY, PLEASE TAKE A PHOTO & SEND TO 415.713.5913. THANK YOU, THANK YOU TO SO MANY OF YOU STILL POSTING SEAN'S FLIERS (across the U.S.). WE WILL NOT LOCATE SEAN UNLESS PEOPLE KNOW that HE IS MISSING. THE FLIERS generate the TIPS - PLEASE help POST Sean's fliers IF YOU live in the U.S.!! I will gladly send anyone fliers, anywhere in the U.S. Refill requests WELCOMED! Please email lynnkching@yahoo.com with your address. 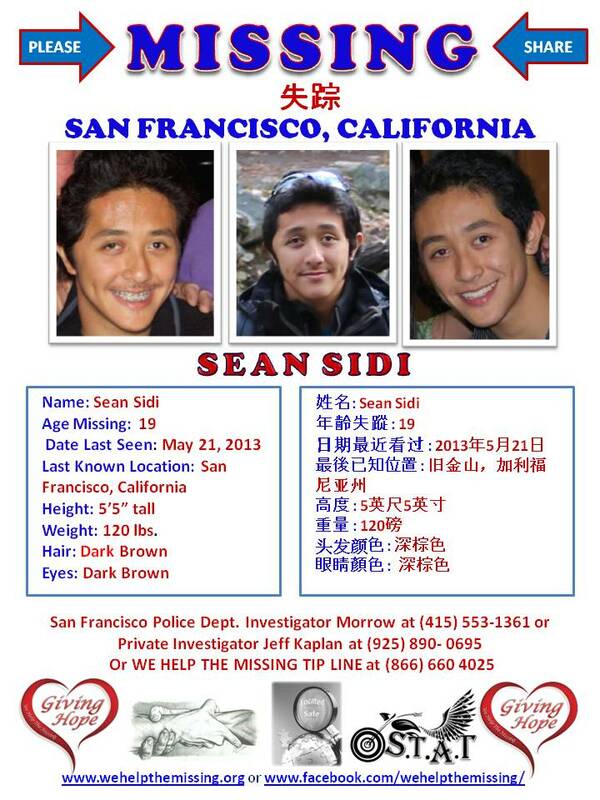 See www.seansidi.com or www.facebook.com/findseansidi for more information on critically injured Sean SIDI (age 19) missing from San Francisco CA May 21, 2013. Sean may not know his name or his DIRE MEDICAL NEEDS due to a severe traumatic brain injury suffered shortly before going missing. 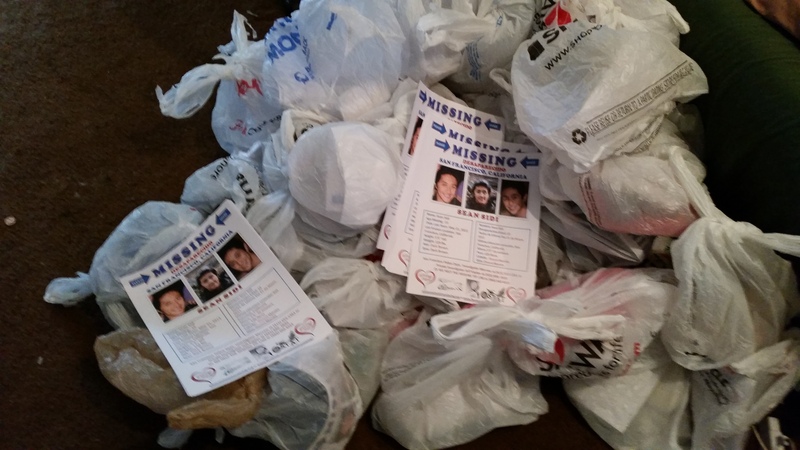 Note: Donations made to Sean's fund will help his family broaden their search by adding the support of a private investigator, printing and distributing thousands of missing person fliers, running newspaper ads and buying radio announcements. 1. There are buttons at the top of the site for for quick links to the Missing Persons Flier, Media Attention (News Links), FRIEND US ON FACEBOOK, and CONTACT US with Tips. 2. DONATE - If you are able, we desperately need volunteers and monetary donations. 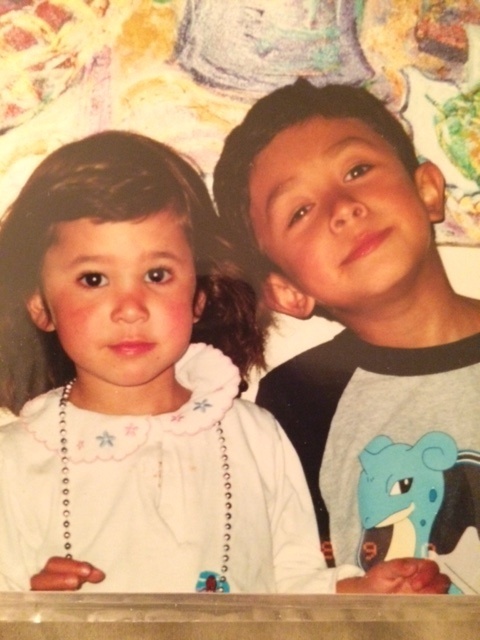 Because Sean is over 18, the police and governmental agencies are/can only seem to offer limited support, we are therefore relying on friends, family, and the community to offer what support they can. 3. Don't hesitate to contact us for any reason! We are trying to keep people up to date with information and search efforts but the rate of information coming in and the incredible overwhelming response by the community has not only touched our hearts but has made it difficult to keep up. Plus we are tired, and worried, and just want Sean home. Please know that we are trying to keep everyone in the loop, so please do not hesitate to reach out and please keep reaching out.